The daily activity of human cells requires the use of a lot of energy. The process of burning energy for use by the body requires oxidation reactions in the mitochondria of cells; this process releases molecules called free radicals. Free radicals are highly reactive molecules, and when they interact with oxygen, the chemical reactions that result damage skin structure and appearance. Skin cells are high in unsaturated fatty acids, which means they have open “spaces” for hydrogen atoms to fit, as opposed to saturated fats which have a hydrogen atom in each place possible, and so unsaturated fats are highly reactive. Once a free radical reacts with the unsaturated fatty membrane in a skin cell, the cell membranes lose their structure and skin will look saggy and wrinkled as a result. 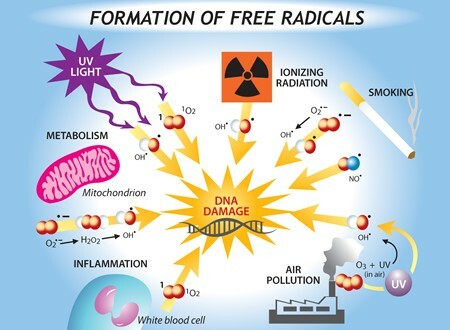 Besides free radicals synthesized in the body, exposure to UV and X-rays given off by the sun and air pollution increases the concentration of free radicals in the body. There are, however, molecules which directly strip free radicals of their power to react with other tissues. Antioxidants are chemicals which inhibit the oxidation reaction of free radicals by exchanging one of their own electrons with the free radical molecules to stabilize them, thereby preventing the deleterious chemical reactions caused by free radicals. Some antioxidants dissolve in fat, while others dissolve in water. Those that dissolve in fat protect biological structures the best, while water-soluble antioxidants are found in fluids within the cells and organs. Antioxidants such as Vitamin E and Vitamin C are very popular in topical skin care treatments, but there has long been a question as to whether these products actually have the effect that they claim. The problem with antioxidants as topical treatments arise from the fact that they are often quite unstable and easily react with sunlight or the air, changing them chemically and reducing their effectiveness. Topical antioxidant effectiveness is also reduced by a limited ability of the skin to absorb these compounds, and the tendency of these products to contain very low doses of the active ingredient. However, new research has emerged over the past five years that supports the use of antioxidants in topical applications , , . More stable versions of these compounds are now available on the market, and one can ensure that the concentration of active ingredients is high enough by creating homemade skin care products. Vitamin E, Vitamin C (ascorbic acid), idebenone, lipoic acid, and tocopherol are all effective antioxidants . It is best to use a variety of these compounds, as different antioxidants are more reactive with certain types of free radicals, and it is important to use both fat-soluble and water-soluble compounds. Burke, K.E., Interaction of vitamins C and E as better cosmeceuticals. Dermatol Ther, 2007. 20(5): p. 314-21. Manosroi, A., et al., Antioxidant activities and skin hydration effects of rice bran bioactive compounds entrapped in niosomes. J Nanosci Nanotechnol, 2011. 11(3): p. 2269-77. McDaniel, D.H., et al., Idebenone: a new antioxidant - Part I. Relative assessment of oxidative stress protection capacity compared to commonly known antioxidants. J Cosmet Dermatol, 2005. Rohr, M., et al., Influence of repetitive UVA stimulation on skin protection capacity and antioxidant efficacy. Skin Pharmacol Physiol, 2011. 24(6): p. 300-4. Yoshida, A., et al., Direct assessment by electron spin resonance spectroscopy of the antioxidant effects of French maritime pine bark extract in the maxillofacial region of hairless mice. J Clin Biochem Nutr, 2011. 49(2): p. 79-86. Carnosine is a compound from two amino acids, produced naturally in the human brain and muscles. Most likely, it performs a protective function – carnosine neutralizes metal ions and is a powerful antioxidant. It is used in skin care to combat oxidative damage to DNA and proteins, such as that caused by UV exposure. Furthermore, carnosine can protect proteins, primarily collagen, from glycation. These qualities make it a promising molecule in the fight against ageing, as carnosine not only protects cellular components, but can improve the visual appearance, reduce roughness and fine lines. It also maintains the barrier function of the skin, both by simple hydration and complex effects in wound healing. Carnosine applications are of special importance to diabetes patients, as it helps alleviate several complications of this disease, among them xerosis, rapid AGE production, and impaired wound healing. Idebenone has qualities that make it a good choice as an antioxidant. Idebenone also promotes cellular energy production. Since it is closely related to CoQ10 it may be used as replacement for CoQ10 in many recipes. Active ingredient in Prevage, MD™ line. Seed oil extracted from the pomegranate fruit contains high amounts of fatty acids, particularly punicic acid. Pomegranate seed oil is the only seed oil with punicic acid, making this a unique extract. Punicic seed is known to have anti-oxidant and anti-inflammatory effects. Present in smaller amounts in this seed oil are estrogen-like compounds which have potential to alleviate menopausal symptoms. Studies with pomegranate seed oil show it acts as a powerful antioxidant by decreasing reactive oxygen species that harm the body. It also protects against sun damage, and can repair sun-related damage to the skin by increasing skin thickness and barrier cell replication. This effect also aids in wound healing and can reduce skin thinning with age.